Can I Light My Grill Manually? In the event your ignition stops working, you can manually light your grill and save your barbecue! It can be a bit intimidating if you have never manually lit a grill before, but rest assured that as long as you follow the simple instructions below it can be done easily and safely. Please note that these instructions only apply to current models. For older models, please reference the instructions in your owner’s manual. Click here to find out how to locate your owner’s manual online. Make sure all the burner control knobs are turned off. Check to make sure they are off by pushing the control knobs in and turning them clockwise until they stop. Turn the LP tank on by turning the tank valve counterclockwise. 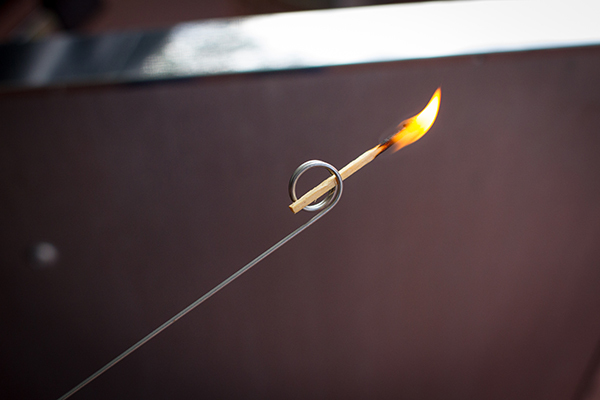 Put the match in the match stick holder and strike the match to light it. Then insert the match holder with the lit match down through the cooking grates, past the flavorizer bars and adjacent to the left burner. Ignite the burners individually going from left to right. Push the control knob in and turn to Start/Hi to ignite the left burner. Check that the left burner is lit by looking through the cooking grates. You should see a flame. For current Genesis and Summit models, ignite the remaining burners the same way going from left to right. For current Spirit models, after burner 1 is lit, you can turn on burner 2 (and burner 3, if applicable). If any of the burners fail to ignite within five seconds, stop, turn the burner control knob to OFF and wait five minutes to allow the gas to clear before you try again. Turn the gas supply valve on. WARNING: Do not lean over the open barbecue when lighting your grill. Forget The Windows…Uncover That Grill!